Trusted Professional, FAST, Worry Free! There is a misconception that an arrest is only valid if you are read your Miranda Rights at the time of arrest- NOT TRUE! Vista Bail Bonds® will do everything possible to bail you. Remember, you are still innocent until proven otherwise. The exact wording of the "Miranda Rights" statement is not specified in the Supreme Court's historic decision. Instead, law enforcement agencies have created a basic set of simple statements that can be read to accused persons prior to any questioning. The Miranda rights do not protect you from being arrested, only from incriminating yourself during questioning. All police need to legally arrest a person is "probable cause" - an adequate reason based on facts and events to believe the person has committed a crime. Police are required to "Inform you of your (Miranda) rights," only before interrogating you. While failure to do so may cause any subsequent statements to be thrown out of court, the arrest may still be legal and valid. like name, address, date of birth, and Social Security number necessary to establish a person's identity. Police can also administer alcohol and drug tests without warning, but persons being tested may refuse to answer questions during the tests. Here are paraphrased examples of the basic "Miranda Rights" statements, along with related excerpts from the Supreme Court's decision. 2. ANYTHING YOU SAY CAN BE USED AGAINST YOU IN A COURT OF LAW. 3. YOU HAVE THE RIGHT TO HAVE AN ATTORNEY PRESENT NOW AND DURING ANY FUTURE QUESTIONING. 4. IF YOU CANNOT AFFORD AN ATTORNEY, ONE WILL BE APPOINTED AT LITTLE OR NO COST TO YOU. The Court: "In order to fully apprise a person interrogated, of the extent of his rights under this system then, it is necessary to inform him not only that he has the right to consult with an attorney, but also that if he is indigent a lawyer will be appointed to represent him. Without this additional warning, the admonition of the right to consult with counsel would often be understood as meaning only that he can consult with a lawyer if he has one or has the funds to obtain one." the interrogation must cease until an attorney is present. At that time, the individual must have an opportunity to confer with the attorney and to have him present during any subsequent questioning. If the individual cannot obtain an attorney and he indicates that he wants one before speaking to police, they must respect his decision to remain silent." San Diego County Warrant Check- Convenient! 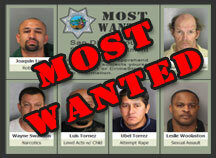 San Diego County's MOST WANTED. Bail bonds for Vista, Oceanside, Escondido, Carlsbad, Encinitas, Poway, Bonsall, Fallbrook, Ramona, San Marcos, Valley Center and San Diego County. Vista Bail Bonds® is located directly across Melrose Drive from the Vista jail. © 1995-2015 Vista Bail Bonds®. "Vista Bail Bonds" is a ® Trademark of Vista Bail Bonds Inc All rights reserved. Phone 760-967-7777 • Serving California and beyond.